Whether at an outdoor exhibition, or on tour in Japan, or on a beach in the Bahamas, our boats attract attention. A kayak that folds into a backpack is a beautiful thing. Often the item of interest is the rudder, at the stern of our kayaks. 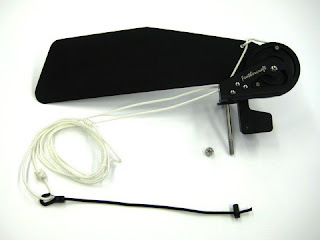 Every Feathercraft we sell comes with a unique rudder system to keep our boats heading in the right direction. Hardshell kayak owners have admired these rudders for years. Fortunately, for those set in their hardshell ways, we offer adaptable rudder systems for a variety of kayak types. For doubles, we have a large fin design that comes in three mounting options. We make a cotter pin design for a stern mounting bracket, an end pour pin that fits into the stern deck and a threaded bolt mount. For singles, we offer the same options with a smaller, sleeker fin. The fins and bolting packages can be purchased separately or as a package. These can be bought online at our website or at our factory store on Granville Island, in Vancouver, British Columbia.